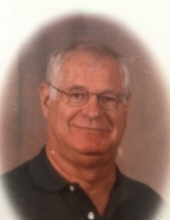 Gerald M. “Jerry” Seaton, 74, passed away at home Wednesday November 28, 2018 with his family by his side. Born on April 17, 1944 in Rockford, Illinois, son of Elbert (“Eggs”) and Lucille (Daughenbaugh) Seaton. Jerry lived most recently in Freeport, Illinois. However, he spent the majority of his life in Pecatonica, Illinois. He graduated from Pecatonica High School and was a veteran of the United States Army. For more than three decades, Jerry operated Pec Barber Stylist. He enjoyed his occupation and continued until cancer wouldn’t allow him to go to the shop any longer. In that shop, he not only cut hair but he hosted many friends for lively conversation. Jerry loved spending time with family, especially as a spectator of his grandchildren’s various activities. Jerry was an avid sports fan with the Bears being at the top of the list. He enjoyed bowling, primarily the social aspects of the game, and made great memories on many trips around the country with his bowling teammates and friends. And, he loved the dogs in his life. Jerry is survived by his wife Joy; his brothers Jim (Kay), Rick (Vickie), and Dennis (Michele); his kids Doug (Shelly), Micki (Kyle), Heidi (Mike), and Jaime (Steve); his grandkids Brittni (Wayne), Kyle, Maverick, Robert, Lucas, Bo, Hanna, Evie, and Hailey; his great grandkids Seven and Paisley; and numerous nephews and nieces. Thank you to all who shared in his life in many special ways. The family would also like to thank the good people of Heartland Hospice for several months of compassionate care. In lieu of a memorial service, a Gathering of Friends will be held between the hours of 12:00 and 4:00 pm, Sunday, December 9, 2018 at the Eugene J Barloga American Legion Post #197, 403 W. Main Street, Pecatonica, IL. Democrats are also welcome. To send flowers or a remembrance gift to the family of Gerald M. Seaton, please visit our Tribute Store. "Email Address" would like to share the life celebration of Gerald M. Seaton. Click on the "link" to go to share a favorite memory or leave a condolence message for the family.